How to get there: This mountain is most easily reached from the E6 highway connecting Oslo and Trondheim. The road crosses the Dovrefjell just north of Dombås, one should either start from the Kongsvold train station or from the Grønnbakken hut. Route description: The normal approach will be to hike to the DNT hut Reinheim, perhaps spending the night there if late arrival, and then climb the mountain the next day. The mountain can be easily climbed from the east side as well as from the west (slightly to the north) side. Comments: The eastern approach can be used also in winter. The mountain can be skied all the way to its summit. 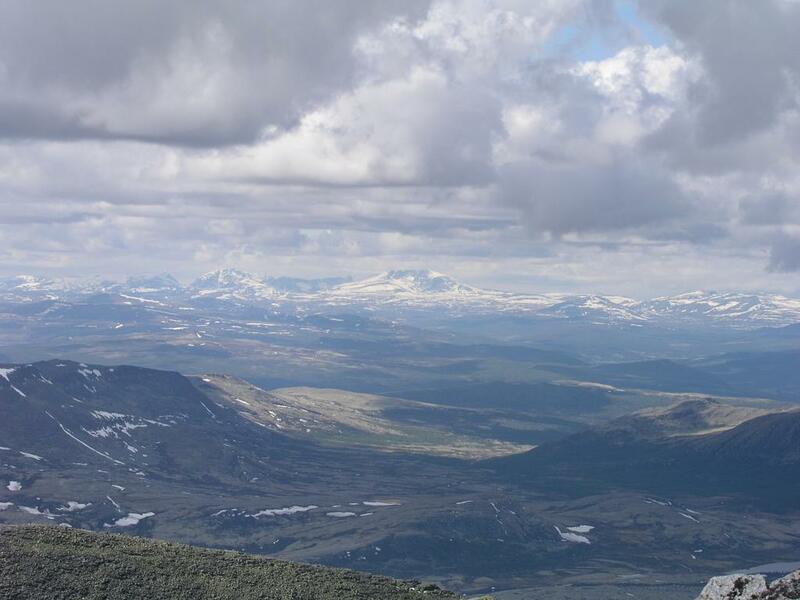 This mountain was at the time before accurate measurements believed to be Norway's highest. The mountain area Dovre (on which Snøhetta is the highest point) has played an important role in Norwegian culture. Snøhetta as seen from the summit of Storsølnkletten.